SCVHistory.com LA3401 | L.A. Aqueduct | Bouquet Dam & Reservoir Under Construction, 1933-1934. Series: Bouquet Dam and Reservoir under construction in Bouquet Canyon, 1933-1934. Part of the Los Angeles Aqueduct system, the Bouquet Dam replaced the nearby St. Francis Dam, which failed in 1928 and killed an estimated 431 people. Like the St. Francis, the Bouquet Reservoir was designed to hold 12 billion gallons of L.A.'s drinking water, which is piped from the reservoir to Power House 1 in San Francisquito Canyon where it is used to generate hydroelectric power for Los Angeles. The Santa Clarita Valley gets nothing from L.A.'s water project except to the extent that overflow is released down Bouquet Creek from time to time. 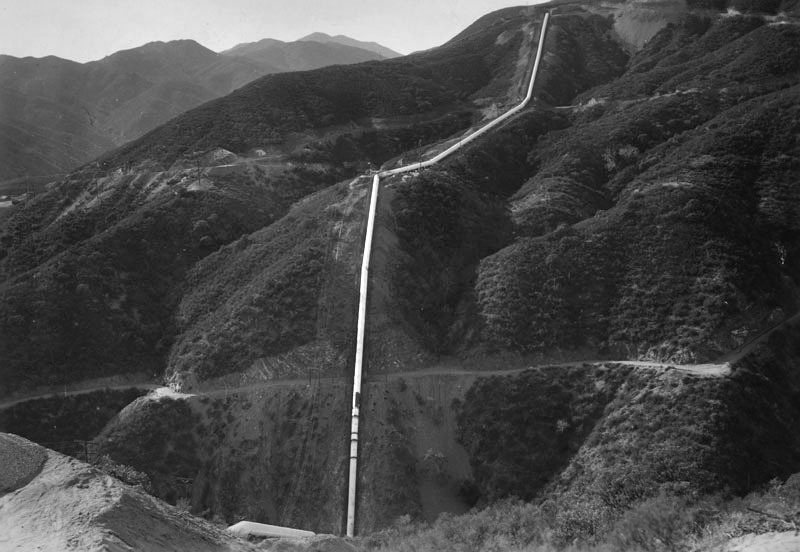 "A pipe line across Bouquet Canyon on December 5, 1933. In the background is the place where the pipeline taps the aqueduct a short distance above No. 1 power plant in San Francisquito Canyon." LA3401: 19200 dpi jpeg from smaller jpeg | Los Angeles Public Library Catalog No. LAPL00044520.